and an ancient art form to its 2018 roster. You’ve probably seen marbled paper on the end-pages of precious, classic edition books, or in the lithe and lively patterns of high-end, decorative art paper. It’s an ancient art form that, until a century ago, was a jealously guarded secret. Today, its deceptively simple process and techniques are more accessible, and Oakland Feather River Art Camp is proud to offer a week-long study with accomplished master of the form, Pietro Accardi. 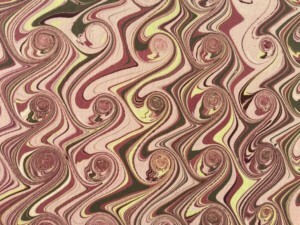 Paper marbling, Pietro points out, is almost as old as paper itself, and emerged as an art form in China and Japan. Over centuries, it gradually spread and evolved, especially into the Islamic civilizations, like Persia, where it achieved special glory. 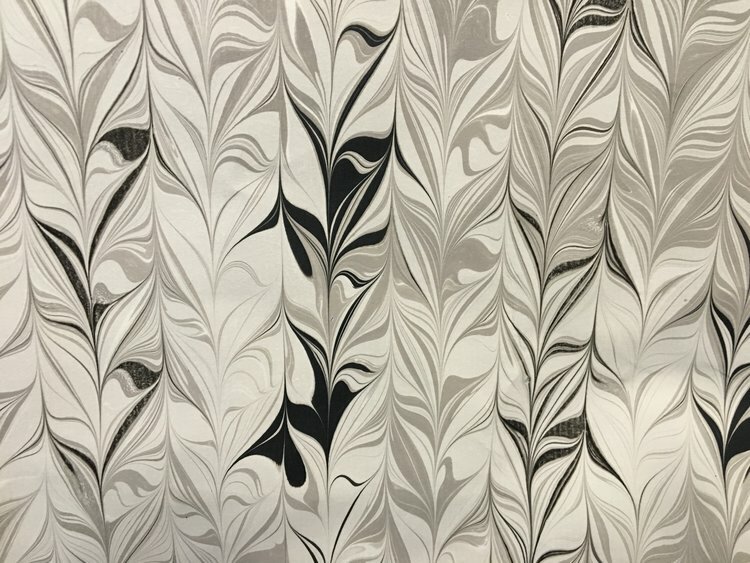 Venetian traders of the Middle Ages who plied the Silk Road, like Marco Polo, brought marbled paper and cloth home with them. Europe was intrigued, and began to experiment with its own approach to marbling. 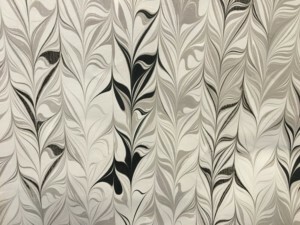 Indeed, as Europe became more and more enamored of complex patterns and techniques, the art of marbling produced a specialized class of professionals. By the 16th and 17th centuries, guilds of these professionals kept the process secret to protect their livelihood. They succeeded almost until the 20th century. “Today, there are no more secrets,” Pietro laughs. In fact, he himself is mostly self-taught. Growing up in Italy, where his father had a printing shop, he was surrounded from an early age by all kinds of paper. 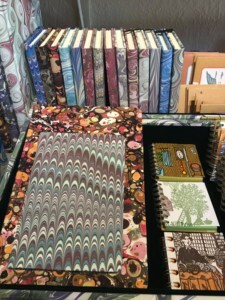 He learned bookbinding, box construction, and most of the skills of the printer’s trade. 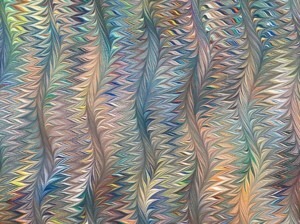 One Christmas, he was gifted with a kit that introduced him to the art of marbling, and a lifelong passion was ignited. “I had all this paper around me,” he says, “so I practiced and experimented. That’s when I realized that your own mistakes are the best teacher.” While that philosophy still guides his approach to teaching, his students will also gain the advantage of Pietro’s own experiments over decades of work. 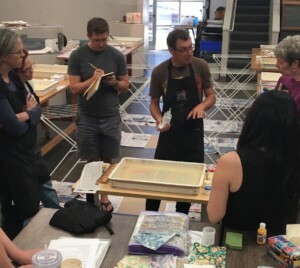 Morning classes will focus on the three main components of the art-water, paint and paper-with hands-on demonstrations. The water needs to be thickened to just the right degree; while various methods are used today, Pietro’s preference is to use carrageenan, a seaweed derivative commonly used in food production, for example, to thicken ice cream. 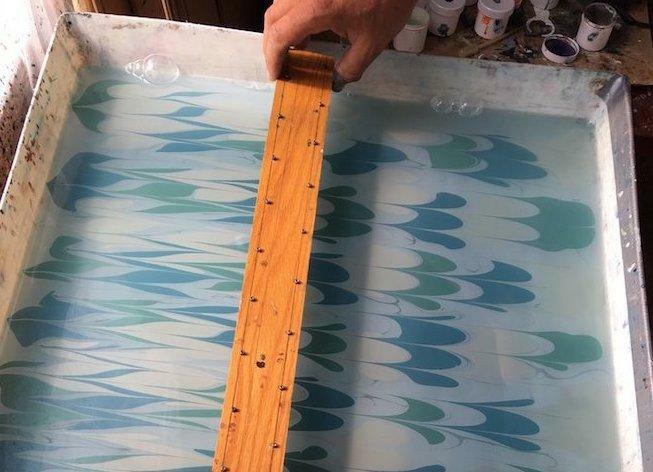 Paper needs to be sized with alum, to best accept the paint on its surface. Then there’s the paint (Pietro uses acrylic): How much is enough, or too little? How does it behave while it floats? 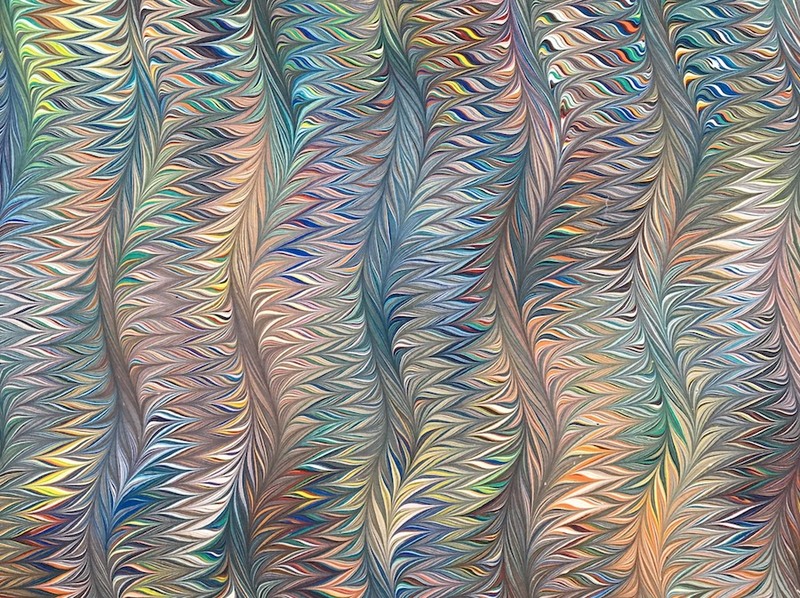 What can be done with a brush, or rake, or comb, to achieve different designs or effects? Sensing a bit of an alchemist’s magic? Afternoon sessions will be unstructured, allowing students to experiment and explore, under the helpful eye of the master. “I want my students to believe in themselves,” says Pietro. Pietro explains the intricacies of marbling.